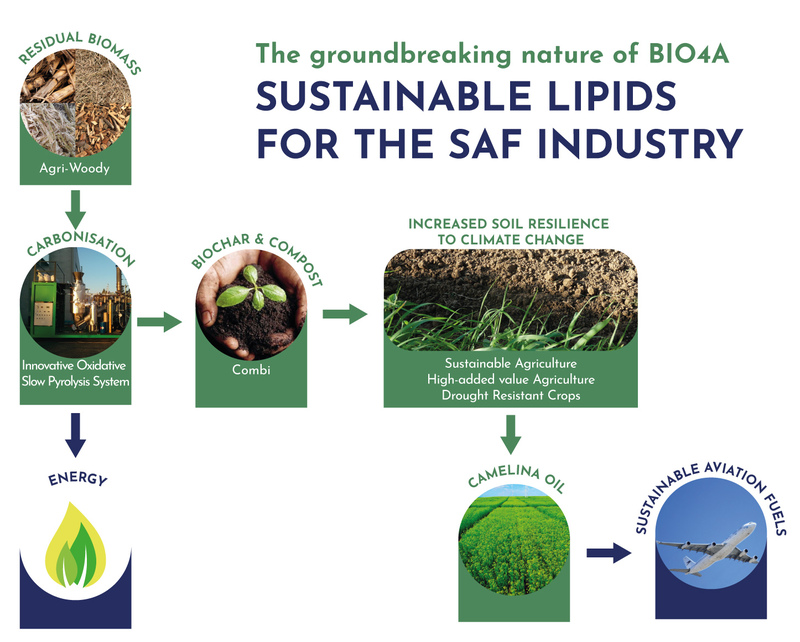 As an alternative to the waste and residual lipids feedstock path, and in order to increase soil resilience towards climate change in Southern EU/MED Countries, BIO4A will develop a dedicated R&D work on soil and sustainable crops such as Camelina, a drought-resistant oil crop. By adopting a combination of biochar and other soil amendments, the research aims at developing a cost-effective long-term strategy to increase the fertility of the soil and its resilience to climate change, while at the same time storing fixed carbon into the soil and producing a low-ILUC biofuel from Camelina. The approach tested in BIO4A can be potentially replicated in large part of EU MED areas. The amount of marginal land in the EU28 is estimated at 8.5 Mha, therefore, scenarios for potential replication in the EU MED area will be modelled, together with a full life cycle and sustainability analysis. The characteristics of alternative feedstock from residual lipids used for aviation biofuels can be extremely variable in terms of physical-chemical characteristics and contamination. For this reason, a research and development activity on cost-effective pre-treatments of residual lipids will be implemented. Thermo-chemical pre-treatments such as catalytic pyrolysis and hydrothermal treatment will be investigated. Once developed, these processes will help to standardize the quality of different feedstock with extremely variable characteristics and contamination, thus contributing to a long-term supply of residual lipids for the aviation biofuels industry.